Need a tonic for the day? Well, look no farther. Here’s one that will encourage and cheer you up some. Do have a lovely day and a great new month. ??? Good food for thought!! Grace as always here with Edith. Don't miss your nomination honor, in my recent blog post. So grateful, Tammy! Sent you a PM on Facebook. You are the best! Real tonic for the day, month, the year and indeed, the rest of my life. I'm blessed by the message of this beautiful poem. Bless you, Aunty Edith. Glad you found it helpful, Solomon. You are soooo blessed! That is so sweet of you! Love you back, Peace, and I pray multiple favour upon you in Jesus' name. This poem shows that whatever you do in life, people will complain and back bite, so the main thing is for you to do what makes you happy!!! Well, if you see it that way, Evelyn, but it has to be within the bounds of decency and decorum. Have a good night! No matter what we do in life people will talk about our actions whether good or bad so we should not mind them and do whatever tickles our fancy. Ummm, that is not exactly the admonition here. It says to "do what you're led to do". That presupposes that the receiver is a believer, led by God's Spirit. So this is not a call to behave anyhow. Bless you, Chidinma! Praise God! Thank you for visiting, Temitope, and God's grace with Topmosttree. Happy new month, ma'am. For a surety, whatever you do, there is a divided reaction to it. If our Savior had divided reaction for his mission on earth, who are we not to face same? I have learned to always smile regardless of what I hear, see and not feel what people say. This poem reminds me of Chief Ebenezer Obey's evergreen ko si ogbon to ole da, ti ole fi taiye lorun Translated to mean you cannot satisfy the world. Criticism must trail one's actions. Wow, I love this. This is very simple, short and smart. I am really encouraged. Thanks, ma, for this piece. Glory to God! It's well with you, Kelechi! Thank you very much, Gloria! Glad to hear from you and the Lord be praised! Stay blessed, my dear, in Jesus' name. I appreciate, Iheanyi! I pray God's upliftment on you in Jesus' name. I always leave my ears open whenever I hear the rhythm of a poem. Though it is just two stanzas with eight lines, it comes with lots of lessons. Good one! Glory to our God! You are highly blessed in Jesus' name, Mark. What a lovely encouragement for the day! Praise God! Glad you visited, Alice! You blessed my heart with your post today. More grace to you, dear sis! That's true, you can't please everyone. Nice one ma! You're lifted, Miriam, in Jesus' name. You're always a good encourager. Thanks for these words. Looking for the good God created in me! Bless you, Traci! It's easy to get sucked into the negative and ruin our day, hence the call to focus on our strengths. I love reading your stories too. Keep them coming, my dear! what you just said is 99 per cent true because so many people out there are just there to judge anything that passes their way. hmmm! dont be suprised. but for more emphasis, some people will see me wakking on heel to school and they will be like, "this girl sef, she likes showing herself... the ONLY LADY that wear HEELS to class, na waooo!" some will not consider the comfort it gives me. i love this, ma. "DON'T TALK ABOUT ME, JUDGE ME NOT"
Eh, me I dey wonder for doz ur high heels, oh. Lol! Do good or bad, people will still talk about it. It's our nature ..... It's advisable to always do things that will please you and not others. As I step out today, I shall make someone happy. Ma you made me realize that often people will want to change me into what suits them, but the truth is we are who we are; different in every aspect. That's what makes me me and not them. Exactly! No matter what you do(of course, it doesn't matter how perfect it is), people will always have negative things to say to you. So just as the poem suggested, its best to pay deaf ears to every form of negativity, so as to reach our heights without limits. Thank you for this post ma! Wow! I am energized already Ma. Your kind and cheerful words in the intro of the poem, and in the Poem itself has given me a cheer. It doesn't matter what people would say, we should do as we are led, and listen for those voices that got our back. As you encourage us, may you receive encouragement too Ma. Not everyone will love you, know that and live around it. You are still your ever wonderful self. It is very necessary that you surround yourself with positivity and positive people. People will always talk whether you do good or bad. Live your life for you not for others. Thanks, Ma'am, you just taught me a lesson. What you think of yourself is what makes the difference. people will always criticize you no matter how good you try to be. I love your encouragements MA. Not everyhuman will encourage you. Most people are bent on deceiving you. Sure! people must say something however creditably or badly you have done or are doing, never mind, especially when you are doing the right thing.But do not allow yourself to be praised when you are doing the wrong thing because people will surely hail you even when you are sheepishly heading into a ditch. Nice piece. I'm this kind of person that don't care about what people think of me or say about me as long as I know I'm right and I'm not in your business, except you as ready to share it. Thinking so much of what people say about you(bad) gives you low esteem about yourself. Pull your self back up,no matter the rumours going round about you and the unfair judgement passed unto you from others. Always tell yourself you're a star and continue soaring higher. Food for thought, ma. Thank you for this short but poignant post. Thank you Ma for this word of wisdom. People will always be people, we cannot please everyone; we can only just be ourselves. Nice. such beautiful words of encouragement to me. Thank you so much ma. The poem is really short but with powerful words that can transform your day and your entire life and attitude if you accept them. I find this poem very appealing, it simplicity enables you to grasp the message being put across, its adopts an advisory tone which draws its reader. Yes ooo No one can limit my bound of joy, happiness and socialization. Am motivated!!! Nice post ma. I find this message very true and uplifting because I had this friend that made me feel bad and sometimes unworthy to be called good, focused. She made me feel she was merely coping with me and not loving my presence. But then I had people that their words marvelled me, they made me appreciate myself and the things I did and how I did them. I discovered my awesome self,, the one Christ died for and made perfect with his blood.Messages like this became a turning point for me. Thank you ma. I love this piece. I love this post, it is one of the first thing to meditate upon after the bible every morning. We don't need negativities to start a beautiful day. Thank you Ma. Short but packs a lot of meaning. I love this poem. Now I know how to act when next I go out...as the spirit leads. Thanks for this great piece ma. There has never been a place for negative people in my life, and there will never be... Thank you Ma., for this reminder. 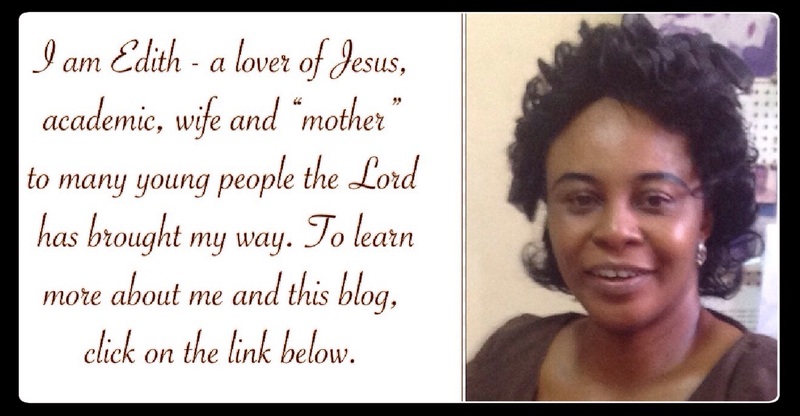 There is never a dulling moment in your blog ma, it's always filled with educative words that gears towards inspiring us to be better persons. It's already too late for someone like me to surround myself with people filled with so much negativity and jealousy as friends because they tend to pollute the good environment you are existing in. I appreciate this, because it encourages me. Irrespective of what we do in life, good or bad, people will always complain. We should mind the kind of friend we have, some are unfriendly friend who are around us to pull us down. as a self acclaimed drama queen, i have always received several hurtful jabs from students who feel my energy is boundless and annoying. but i have decided to re-evaluate my self worth and understand that their comments do not change anything about me. as i step out each day, i will consciously live to be a blessing and never allow the words of criticism pull me down to depression. Oh my God.....quite inspiring....Ma you just made my day,thank you so much. One should stick to what he or she is doing or believes in, so far it is in alignment with God's will. Criticism ofcourse will weigh you down, but stick to it and make a difference. Truly, not everyone can like a person. If a person is liked by everyone, the person needs to double check, something is wrong, absolute wrong. It's impossible to please every mortal at a time. In all, it's best to do what one knows is right. If you give in to letting people's bad words affect your person, then be less assured of ur success. What keeps me going is my less care nature, in fact I've got less worries. Nice poem Ma! U said it all just in a few sentences. No matter how good or nice you may be ,you cannot please everyone.Its nature.Thank you so much for this post ma,for it has opened many people"s eyes that you cant look good in everyone's eye. every christain needs words of edification for each day in order to conquer the evils of the day. this prayer will definitely follow us as we go to our various destination and i pray that as i step out each day, the love and mercy of the lord will never cease to be evident in my life. thank you ma for inspiring me. This is a lovely poem, as a believer, people will surely stand to criticize you and some will stand for you,have an unflinching faith and all will work out well for you. Indeed, be yourself and the real you belecause people will always talk and you can never satisfy everyone. Also focus more on the positives and forget those who are negative kill joys. Good peom ma. it is really tonic. most people love it when you are sad than when you are happy .they like to see you pain always when you are sad they are comfortable and ready to mock you. I believe you ma. There is nothing that one can do without He or She being criticized, it always better to be around those that appreciate the kind of your person.may God help us. As we go about our daily lives, we should do what is right and what makes us happy. We shouldnt bother ouselves about what people think as long as what we are doing is right. Yes o we should all keep our smiles on and do what makes us happy every day we step out of our doors having closed ears to the ill people may say about us and smile back to those who appreciate our happiness and there is no greater joy than innermost joy as long as we are on the right track our day will glitter. Do the good things your heart adjudged right. Do not mind what people may say . Although no one is perfect, try let your good aspects overweight your bad aspects. This is an interesting poem. Wow! This is an inspiring poem. It is true that not everybody will appreciate what you do, no matter how good you try to be at what you do, just keep doing what you love best. Don't ever do things against your own will, in order to please a particular set of people. This is an encouragement to do what makes you happy and be happy not withstanding whatever the crowd is saying. Awesome piece ma. May God always be praised through your works. I consider this piece a strength given poem. Many peoples dreams have died because of other peoples comments about what they. This poem is right in time to give hope and strength to them and even me. As I step out today, favour, break trough shall be my portion. This piece of write up carries a lot of strength in it. This poem gives hope to the hopeless, good post ma. I love this poem!!! Do what makes you, because people will always talk even if you try to please them, they will still talk so it's to do what gives you joy; let them talk but the main thing is that you are happy and [proud of who you are. 'do what you're led to do...' This line got me pondering... Most times we tend to pay unnecessary attention to the opinions of people and allow these opinions define us. It is however really wrong! There's nothing so real as being oneself. Critics will always surface but ones ability to stand them makes him even more real because so many has been mislead into living a fake life because side talks. To people like these are aunt referring to. Be real, be yourself and don't let anyone shout you down. abilities differ. Thank you very much ma for your words of encouragement and i know no matter what people say, it wont stop me from doing what i believe is right, bless you ma. Truth is, no matter what you do there are people out there that will appreciate and othets will criticize,it is best to focus on what you're meant to do and do it well. their is nothing one can do on earth to please everyone ... The thing is jux try to please ur maker. ..Dts d one dt counts... Infact...i noticed dt d more successful a man becomes d more enemies he has.. Bt jux dm eeep . Do u tin joor. .. This poem torchlights the different reactions of people to our personalities. Onetime,someone called me an "attention seeker". I attributed this to the fact that I was a socially active person.I've learnt though from this post to live above their criticism and do what makes me smile,Brings me joy and much laughter.Thank you ma for this refreshingly wonderful poem. Wow! Love this! What a wonderful piece! No matter what people say about you, Stand out with courage ,believe in yourself. Don't be discouraged, love yourself and everything will turn around for good. This poem is really motivating. Word of encouragement MA....may he endow you with more blessings to do more. this poem is small but might, some people can never appreciate others no matter what, even when they know the person did good thing, instead they will criticize the person and copy the person in silence or in the private room. my advice is that we should know who we work with, because is only a true friend that can help bring out the best in you, donot forget that one must be your friend before being your enemy. Most people do not appreciate what other people do whether it is good or bad. Instead they will find a way to criticize the person. Everyone has different reactions to a persons personality. Most times critism brings out the best in people and makes them stand out in the crowd. Therefore surround yourself with people that Will lift you up positively and always encourage you. People would always try to bring you down with their words because they envy you, I had a conversation with someone last night similar to this. It’s left for you to either let them bring you down with their words or for you to use their words as a ladder to even climb higher, I’d advise you choose the latter. Thanks for the encouragement MA... Surround yourself with positive people. Wow! loving this ma. some people are just bent on seeing the bad side of people. Do what is good and the things that pleases God not men. No matter how good or bad you are, people must surely talk or criticize you. So the best thing to do is to ignore them and continue doing that which u know is right. God bless u ma for this encouraging poem. In life we have destiny builders and destiny destroyers, friends who will make u and the ones who will mar u. Some who want the best for you and some who don't. If only we can be cautious of these, there's sure success and fulfilment.God help us! Nice poem. This is a good reminder that everybody will have their own opinion about you and about the things you do. So we should not build our lives based on peoples opinions about us but it is important to note that listening to peoples advice sometimes can be helpful. People experience problems everyday,the best you can atleast do is to be nice to them Don't criticize rather encourage them. Also, no matter what people say always be yourself, do what is right and what makes you feel alive and happy. Remember, if Christ was criticized, same can happen to you. Quite elevating.. Believe in yourself and be happy even though people may look down on you.. Stand with words that energise you at all times. Don't let anyone take away your happiness.. Sincerely, this is a lovely poem. As I step out everyday, I won't let anyone kill my joy. I was'nt born to please everybody. Your good friend will always energise your spirit,they will always find the good in you. 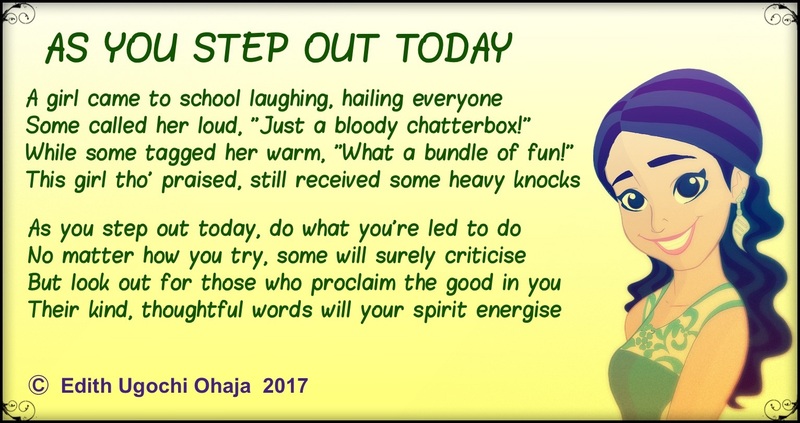 Focusing on bad speeches will only succeed in bringing you down but with our mind on uplifting ones will go a long way in energising us. We shouldn't care what people say about as long as we are sure it's right before God and man, because no matter what we do people are bound to find fault. As u step out, do what makes you happy, stay away from negative energy and spend time with people that celebrate you!